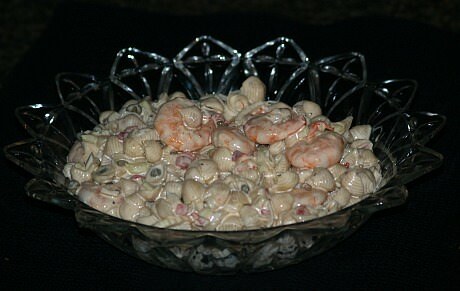 Learn how to make shrimp salad recipes. The small coldwater shrimp has been “designated” for salads although any type can be used and cut into the size you prefer. This coldwater shrimp is one of the three basic types of shrimp. These small shrimp are cheaper to purchase because most people prefer the larger ones to cook with. They can also be purchased frozen and in small cans. The small COLD WATER TYPE are harvested wild from the cold waters of Iceland, Norway, Greenland and the cold waters of United States; the borders of Alaska, Washington, Oregon and Maine. They are softer in texture and sweeter in taste than other family members. As I said earlier, when you are learning how to make shrimp salad recipes the other two basic types of shrimp can also be used. Most of the wild WARM WATER TYPE consumed here in the United States comes from the countries of Mexico, Ecuador, China and India. Within this type of warm water shrimp, you might see many different names for these like the Spanish name camerones meaning shrimp, tiger or prawns. The third group, FRESH WATER FARMED SHRIMP TYPE, can also be used in salad recipes. At least ninety percent of the shrimp eaten here in the United States are of this category. Most of this “fish farming” is done in Asia. The shrimp are raised in manmade ponds where the production rates can be influenced under control of the diets and water. Some of these can grow to be a foot long and can weigh over a pound. If you are learning how to make shrimp salad recipes, the first one is delicious with the sour cream and other ingredients. Although this salad has the pasta and sour cream which add fat and calories, shrimp is very good to eat when cutting calories. Many variations of this salad are simple, delicious and very low in calories. The shrimp cocktail is a very popular version which is only cold cooked shrimp served on crushed ice with a cocktail sauce. Serving a plate of shrimp and vegetables would also be called a shrimp salad recipe. 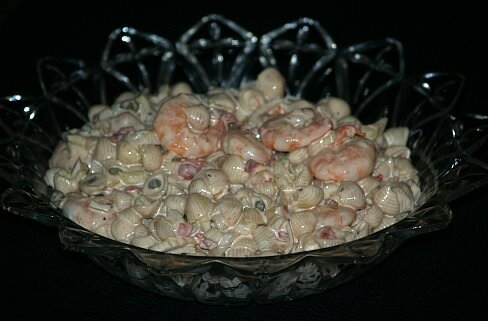 Then we have many congealed salad recipes with shrimp which are delicious and make a beautiful presentation for parties or special occasions and can be low in calories depending on what is added to the recipe. Combine all ingredients and mix well. Refrigerate for a few hours before serving. Dissolve gelatin in the boiling water and add salt. Add the celery, shrimp, olives and pickles; stir to blend. Pour into mold and chill to set. Heat canned soup and remove from heat; add the gelatin mixture and cream cheese and beat until blended. Spoon into mold and refrigerate until cold and set. Cover shelled shrimp with boiling water; add red pepper flakes, white wine and thyme and cook for two minutes. Drain and rinse shrimp under cold water. Toss shrimp with pasta, artichokes, onion and parsley. Combine the vinegar, oil and mustard; whisk to blend. Toss vinegar oil mixture with shrimp and pasta mixture; season with salt and pepper.